Early post today because we are headed to the Ohio State Fair (as long as my son is feeling better when he wakes up -- he's had a sore throat since early Monday)! Can't wait to see all the quilts. My grandmother had at least six state grand champion quilts while I was a kid (plus tons of crochet items that also won.) Hopefully I'll have a few pictures of this year's items for you later this week. Anywho... here's what I did this week. (My little man was sick for a couple of days... :( so I got in just a little more sewing than normal. Here's a few flowers that I did this week. I don't have the hang of putting them all together just yet, but I still think they are cute. Here's the block I did yesterday for the Tetris QA. It's #3 of 6 blocks. I also managed to finish my August Block Swap Adventure block early during a sleepless night. This block is for Karen in Portland, OR. It is the signature block from Quilter's Cache. The tumbler charm quilt continues. Here's 17 rows. Here's Block #3 of the Tetris Quiltalong with Melissa at Happy Quilting. There are three more blocks to go in the QA. I love how happy this block looks with the bright blue sky and all the green around it. White Cream -- The "void" spot is the cream instead of the white. There's still plenty of time to join. These blocks go together lickety split. Look how big it is already! Here are all my blocks together. I requested a block with orange or yellow or orange and yellow. The design of the block was up to the maker. Thanks everybody! This isn't the final layout. There will be some sashing involved too. I haven't decided on the sashing fabric yet. Have a great weekend! This pretty block arrived yesterday from Brenda in Washington. It fit perfectly into my collection. It's the last block needed for this quilt. Thanks, Brenda! For my next set of blocks I have requested churndash blocks with a cream background. I can't wait to start seeing them! This week I finished the other eight Silly String blocks for the Block Lotto. I made one more flower with hexagons. Of course I worked on the tumbler charm quilt. Here's the June challenge: I kinda like the pebbles, but they are a TON of work. 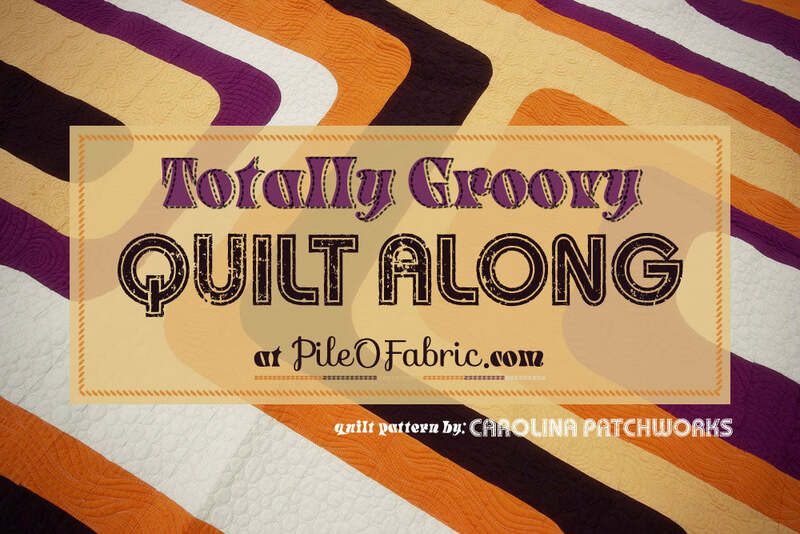 I couldn't resist and purchased my pattern for the Totally Groovy QA. I thought for sure I would win one at the end of July, but I just couldn't wait. The pattern is sooooooo cool how it is put together! I'm letting my fabrics lay on my computer desk. I don't think they are working for me. What do you think? Will it work for this pattern? Of course I have progress to report on the tumbler charm quilt. Here it is folded in half at 15 rows. Here are the nine blocks that I submitted for the Block Lotto for July. This block is called Silly String. It's a pretty liberated modern block. The background had to be light but not white or cream. The three "strings" were to be bright. Two of the strings were supposed to cross and one not cross. I got up this morning and went to my computer/sewing machine area. There to greet me was the sweet little calico flower that I made late last night hanging out with last week's flower. Love the calico! It's so happy. This weekend I'll look for tutorials and YouTube videos on how to put them together. Getting just a little sewing in here and there. Here's what's happening this week. The Tetris cubes are falling. Here's the first set of blocks (1 of 6). I made a silly string block for the July Block Lotto. Added more rows to the tumbler charm quilt. Rows 13 and 14 were added this last couple of days. I made my first hexagon flower. I now have it pinned to the curtain near my sewing machine. It makes me happy. But I'm still considering the Great Granny Along... Oh how this is bugging me! The "void" spot is the cream instead of the white. 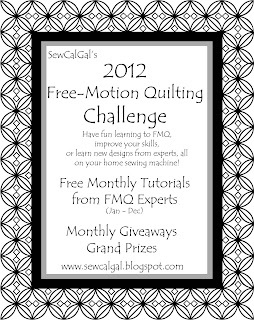 Check out the HUGE giveaway at It's Sew Kiki! It's like Christmas on her blog (and Easter, and Halloween).. and patterns galore. Check it out!!! Melissa at Happy Quilting is hosting the Tetris Quilt Along. Do you have all your squares cut? Today is the day that the pieces start dropping! I'm excited to start my 16 x 16 grid of blocks. Can't wait! There's still plenty of time for you to join. For now all I've got is just another shot of my tumbler quilt... Dozen rows and growing! Our poor grass. We need rain. Dishes done, kitchen clean, laundry done... okay to proceed on the tumbler charm quilt. Row 11. The Christmas fabrics are starting to show more. I can't believe I still have plenty of tumblers left without repeating a fabric. Whohoo! Mostly thanks to garage sale finds of scraps. Here's my FNSI results for 7/13. The tumbler charm quilt is eight rows now. I love that it's big enough to fit the California King bed, although it won't be for the bed. Here's my little helper posing with it. It's about 1/5th of the way done! I'm happy that the tumblers are still matching up nicely! 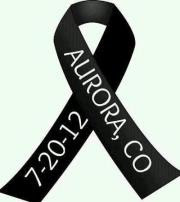 I can't book a craft retreat right now... but celebrate Copper Patch's grand opening by entering. I now have over 1000 hexagons cut. These measure 1" finished. Ummm is this too serious for my first hexagon project--a hexagon postage stamp quilt? Hmmmmm. Here's my first flower. I'm really happy with it. It's machine sewn. LOVE YouTube stuff. I thought these blocks would be much harder, but it worked out great. I only marked the center square. I thought I had to mark them all. Now I better watch another video on how to attach all the flowers once I make them. Probably the same way. This flower is what I worked on a little for the FNSI. I decided to skip the "spooky" theme and just work more on my tumbler charm quilt too. My husband came home from working out of town earlier than expected and we got to have our "date" night (with our little five-year-old.) I'll update tomorrow on how much sewing on the tumbler actually got done. But I do love my one flower! Here's the awesome block I received from Lori in Frankenmuth, Michigan. Aren't the colors great? It fits in my group perfectly. Lori also sent some brochures about Frankenmuth, MI. I haven't been there, but I know my parents and my aunt and uncle had wonderful trips there. Thanks, Lori! Have you seen the Great Granny QA yet? Oh my... so tempting. Here's the tutorial on how to make the squares.